Lucidchart gives Mac users all the diagramming power of Visio in an easy-to-use, cloud-based package. This post is brought to you by Lucid Software, creator of Lucidchart. Does your organization have people in several remote locations who need to work on visual documents together? Now you can forget about e-mailing files, saving versions and all the related headaches: With Lucidchart, anyone can collaborate in real time to create charts in the cloud. And Mac users can get to work with Lucidchart at a fraction of the cost of Microsoft Visio. Lucidchart is an online visual communications application that allows team members to sketch and share diagrams in real time. Its robust shape library includes ready-to-use templates like network diagrams, flowcharts, process maps, wireframes and more. Members of all your teams — from IT and engineering to business to product management and design — will find the tools they need to work together quickly and efficiently. Lucidchart’s straightforward, drag-and-drop functionality means all team members will be up and productive in no time. And its cloud-based collaborative features, including in-editor chat windows and group editing, mean multiple users can contribute to diagramming at once. There’s no software to install or update, because Lucidchart is built on HTML5 and Web standards. It works on any major browser or Internet-enabled device, providing an intuitive and truly collaborative diagramming solution for your entire organization, from HR and marketing to engineering. It is so user-friendly that there is virtually no learning curve, and it is always online and just a click away. Mac users in particular will love Lucidchart’s intuitive design — and its total lack of compatibility problems. Lucidchart can import and export Visio files, so Mac users can collaborate with PC users stuck on Microsoft’s diagramming software. It also fully integrates with Google Apps and Drive, and you can securely and conveniently access documents from Confluence, JIRA and Jive as well. Lucidchart is also secure and dependable. All your data is encrypted, and Lucidchart is hosted from multiple secure servers. 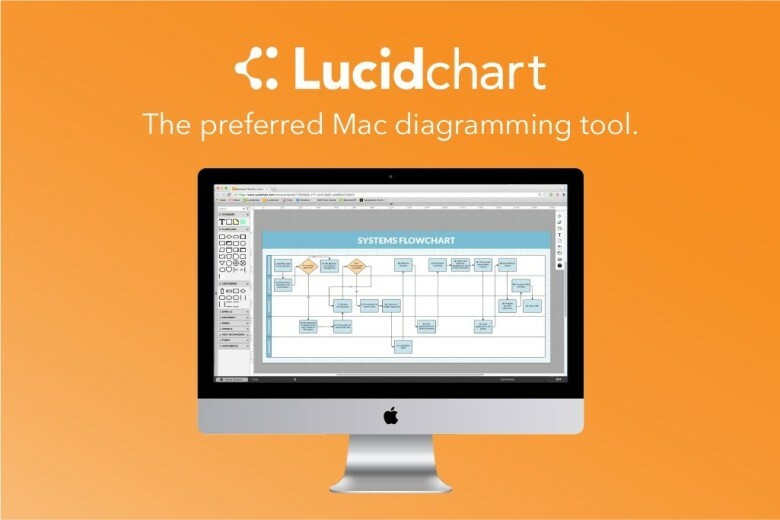 It’s a great cross-platform diagramming tool for enterprise-size companies that use both Mac and PC, and Lucidchart is much more affordable than Visio for Mac. Single users can sign up for free, or try Lucidchart for 14 days. Companies with five to 100 users can get Lucidchart with unlimited objects and 5GB storage space for as little as $21/month.